Enjoy this classic New Orleans sandwich with grilled and marinated vegetables for even MORE flavor! Mix together the vegetable base, olive oil, red wine vinegar, oregano, crushed red pepper, sugar and parsley in a small mixing bowl. Reserve 1/4 cup. Add the marinade to a large re-sealable plastic bag and add the sliced vegetables. Toss to coat. Marinate for 20 - 30 minutes. Remove the vegetables from the marinade and add directly to the grill. Grill each vegetable for 2 minutes per side. Carefully remove the vegetables from the grill to a large cutting board. Cut the vegetables into ½ inch to 1 inch pieces and add to a large mixing bowl. Add the olives, grape tomatoes, pepperoncinis and reserved marinade to the mixing bowl and toss to coat. Place the sliced baguette onto a baking sheet. 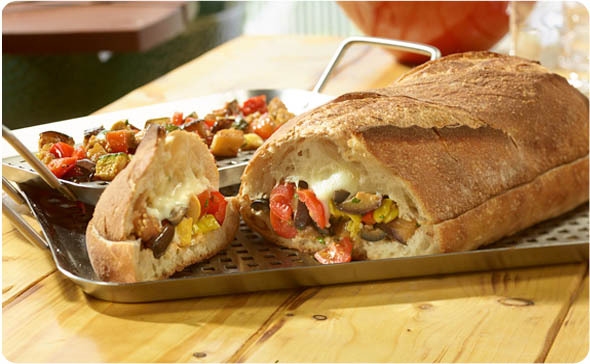 Fill the bottom of the bread with the vegetable mixture and sprinkle with mozzarella cheese. Place the top on the bread and place the pan into the oven for 3 - 4 minutes or until the cheese melts. Slice the muffuletta into 2 – 3” sandwiches. Serve immediately.